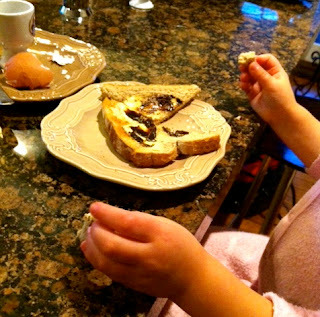 Sometimes the nicest things for breakfast are the simple things. 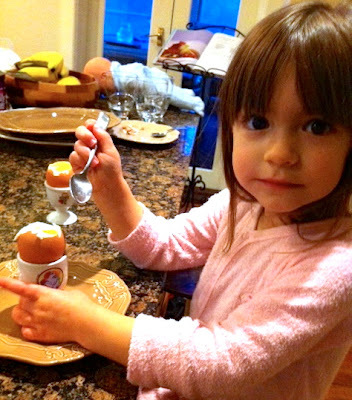 I have my little next door neighbour (granddaughter) sleeping over at the moment while we await the arrival of a little brother and this morning she fancied a boiled egg for breakfast. My eggs at the moment are from my friend at work who keeps chickens and so I like them more on the firm side than lightly boiled just to make sure there are no problems with them, especially for little ones. Bring water to the boil and let bubble for 3 minutes for lightly boiled or longer for hard boiled. Remove from the boiling water and place in an egg cup of choice - preferably one with "My little pony" on the side! 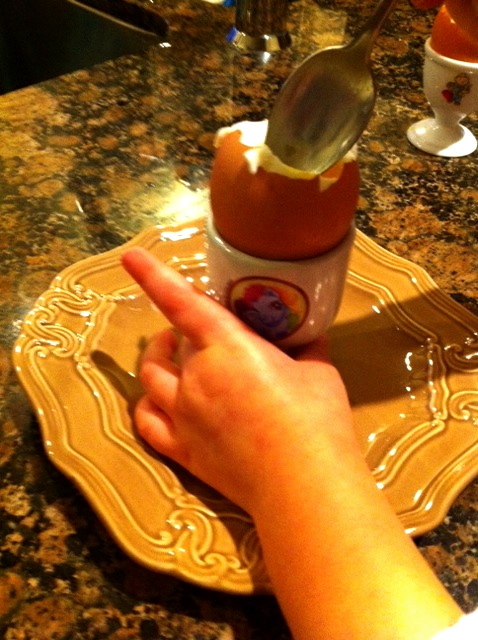 Crack the top with a spoon so that little fingers can peel away the shell. Toast the bread and spread liberally with butter and vegemite. 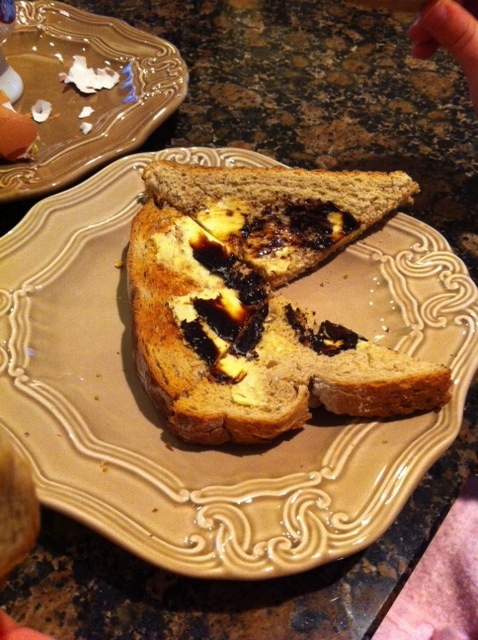 I wanted to cut into soldiers but she wanted triangles. 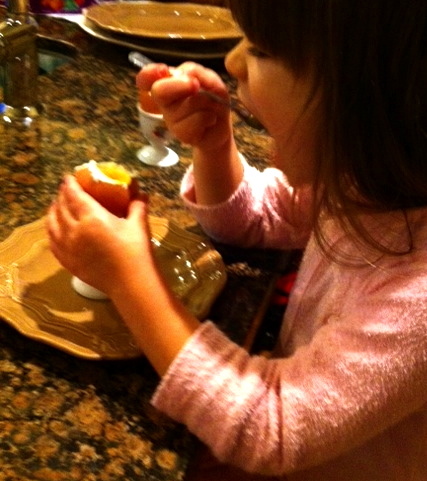 You are right, simple things are always the best, she'll never forget the taste of a fresh egg from happily reared hens! Wonderful! You have just helped me decide what to have for breakfast. How lovely to have a supply of fresh eggs, too. 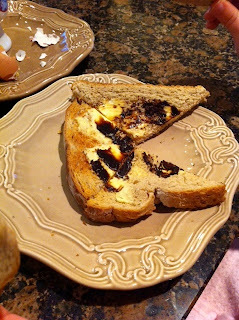 We trade - she provides eggs - I provide chutney, cake, biscuits! Nothing better than a runny yolk, I love to dip dip dip. I love boiled eggs with runny yolk dipped with some toated bread sticks for breakfast . It's been a while that I've not make any for breakfast . Now I'm craving for some after looking at your fresh boiled eggs! YUM! It makes me feel good to have fresh eggs in the house - I would love to have chickens too but I think Max the dog would be frantic all the time. He is a bird chaser at the best of times. The new little boy is gorgeous. Love an egg for breakfast. I'd love to have chickens but am rather afraid of Mr. Fox who visits every night! I know - I would love to have chickens too but Max wouldn't rest he chases everything smaller than him! The poor chickens would be too frightened to lay eggs.